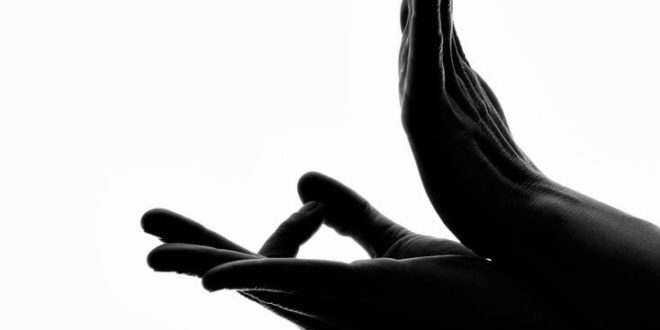 Mudra is an ancient Asian method, known as the yoga for fingers, which effectively eliminates various painful processes, conditions, affects the psychophysical state and immunity. The tops of the fingers are very well innervated, which means, there are many nerves ends in them, which makes the tips of the fingers very sensitive. If we press the fingers from the inside, we automatically solve a physical, mental state. You need to connect the tips of thumbs, index fingers, and middle fingers of both hands. Then bend your finger and straighten your finger. Gently press the cheeks and at the same time lightly and deeply breathe and exhale. Repeat this exercise three times in five minutes during the day. When performing this exercise, close your eyes because you will relax more quickly. The energy point for the neck and shoulders is located between the small finger and the ring finger. Strip this part five times, and then massage the same point with light circular movements. If you are constantly sitting at work, you probably have a lot of pain in your back. The irritated nerves on the spinal column will soften if you lightly massage your left thumb, from the root to the top on the outside. You should also repeat this with your other hand. During this exercise, you should remove all jewelry from your hand. If you are a woman who feels bloated and crunched during the PMS every month, apply an exercise that affects the uterus and the ovaries. You need to gently and alternately massage the small finger joints for a minute. After a few minutes, you will feel relief.